I was recently asked if I could publish more traditional Italian recipes. 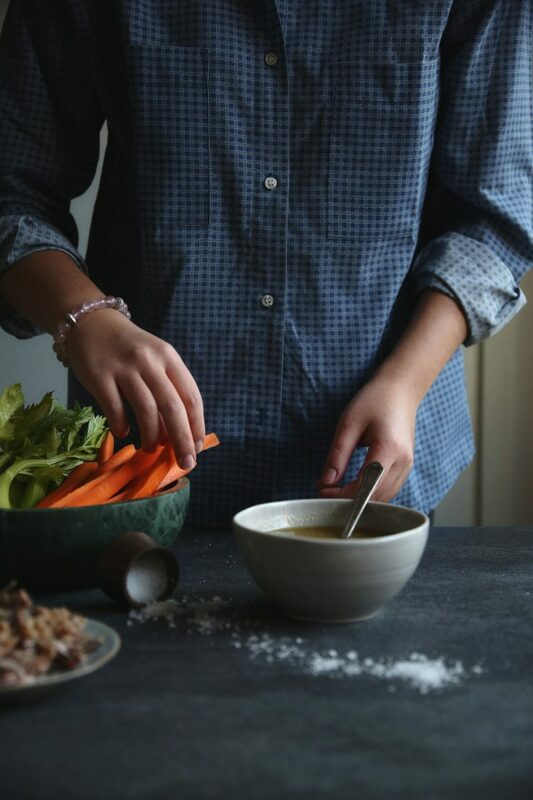 The truth is that I’ve taken these recipes for granted, as they are our family’s everyday food. When I told dad that I was editing some photos for a post about bagna cauda, he immediately asked: “Didn’t you already publish it?”, and he’s right. 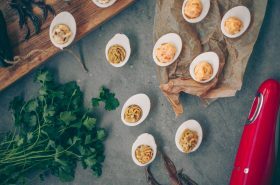 On the blog you often find my discoveries, new flavors and interesting combinations or then Finnish traditional food, because that is for me a discovery too and something I’d like to bring to light. Be sure, though, that I am still firmly and tightly connected to my roots, to traditional Italian cuisine and ingredients. Maybe I haven’t written so much about it over here because it is a little painful. 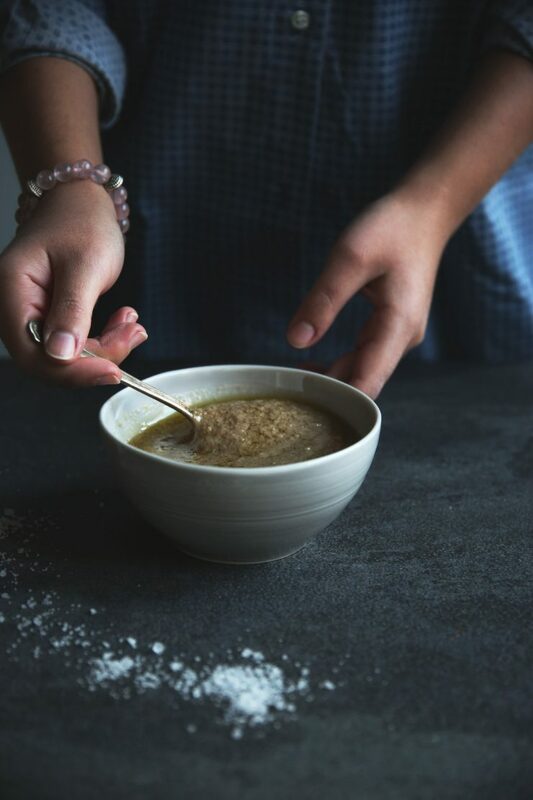 Traditional recipes mean memories, memories mean absence. Now you have to know something about me. The deepest way how I can express myself is through writing. When I was teenager I used to write a lot, short stories mainly. Only when I put down in writing my thoughts and ideas I can truly process them. So, writing about recipes I used to cook in Italy with granny or dad hurts, because I miss it. It is a bittersweet feeling, that is often eased when I think that we can create new memories like these every time Klaus and I go to visit them. But now, let’s cut to the chase. Bagna cauda, which in the Piedmontese dialect means “hot sauce”, is a dip made out of anchovies and garlic. As you can guess from the name, it is served hot. The taste is quite strong and salty, the texture is creamy. I remember like it was yesterday when we used to sit around the warm wood stove we had in the living room, a terracotta bowl with the dip on it and vegetables in our hands. 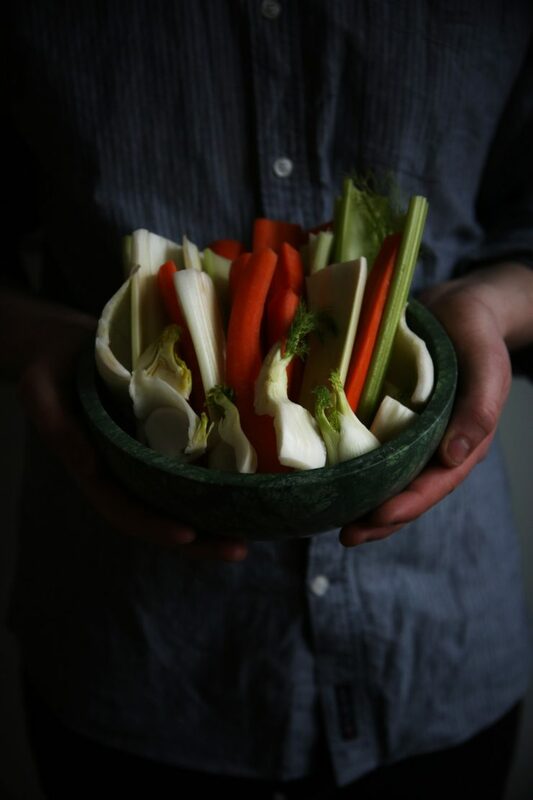 The story behind bagna cauda is really interesting. This dip dates back hundreds of years, during the Medieval time and it was the food of the poor, despised by the rich class because of the massive use of garlic that the recipe calls. Now you might rightly ask: “But didn’t you say that this recipe if from Piedmont? Piedmont doesn’t face onto the sea right? How come they had plenty of anchovies?” Well, you have to know that for more than four centuries Piedmont, Valle d’Aosta and part of France (including Nice) were under the Duchy of Savoy, a state under the Holy Roman Empire that ruled the area. During that time, the salt roads were still commonly used to bring the precious salt from the coast into regions where this ingredient was lacking. One salt road went suitably from Nice to Piedmont. Salt was highly valuable back then, a luxury product. 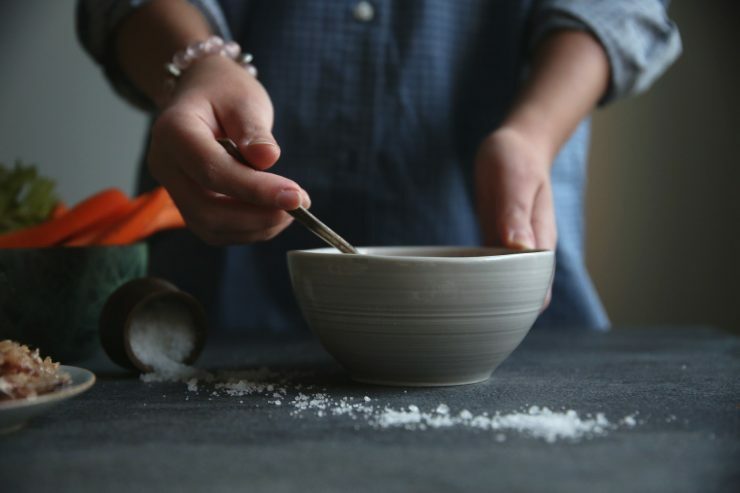 Legend has it that the merchants, in order not to pay the costly salt duties, would put the salt at the bottom of the barrels and cover it with anchovies, that would be sold very cheap once arrived in Piedmont, whereas the salt would be sold for high price. 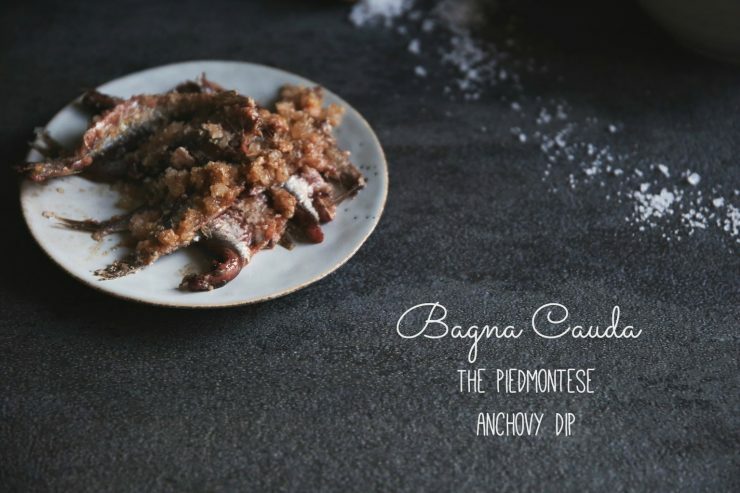 Whether this is true or not, bagna cauda has a really long history in Piedmontese tradition. 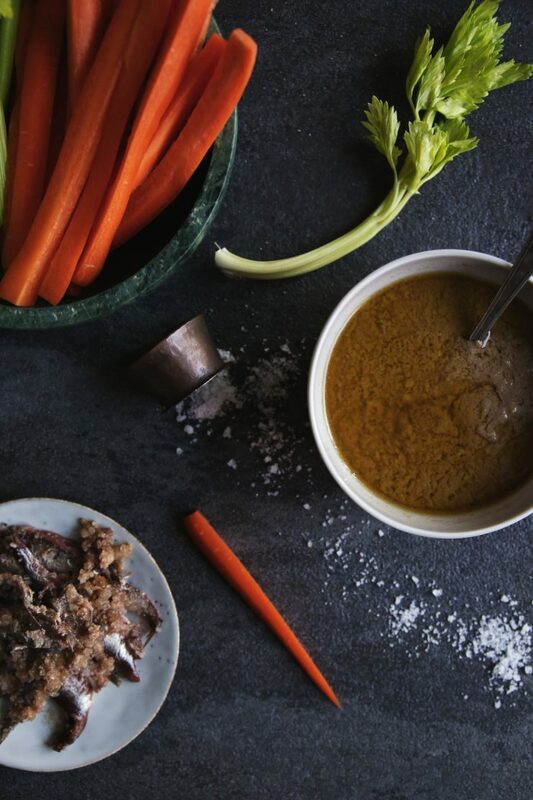 More than a food, this anchovy dip is a convivial ritual, where everyone draws some sauce from the same terracotta bowl in the middle of the table, kept warm by a candle placed in its designated area beneath it; it is a moment for sharing and being together. Usually bagna cauda is eaten along with fresh vegetables, that are dipped in it: carrots, celery, cabbage leaves, bell peppers, fennels. Other ways how to eat this sauce is to make a salad out of finely chopped cabbage and the sauce, or cover pickled red peppers with the sauce and cook it in oven. This post happens to be absolutely timely as the “Bagna cauda day” will be held this year November 25th to 27th. 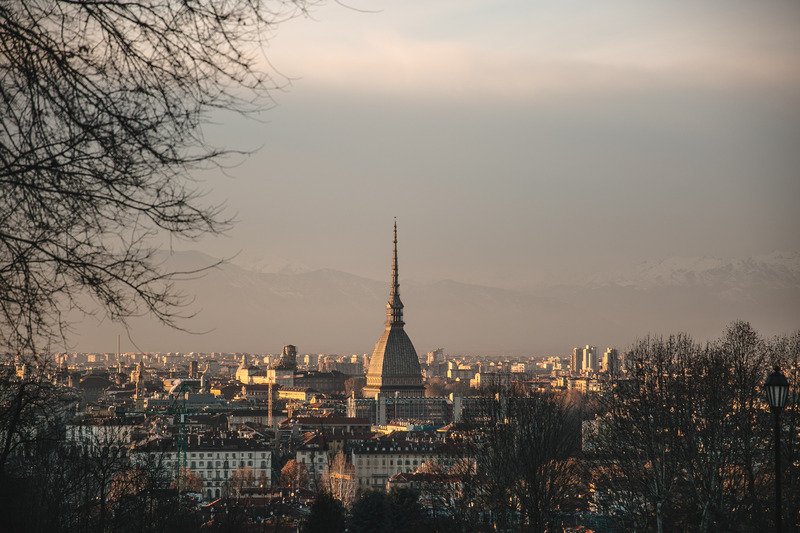 If you want to visit Piedmont, this is the best time to do it, as you can get to taste bagna cauda in more than 150 restaurants at a fixed prices, along with the perfect drink: Barbera d’Asti wine. Some other restaurants in the world celebrate the “Bagna cauda day”, find the complete list here. And now it’s recipe time! As this recipe is hundreds of year old, you might guess that there are many versions of it, but mainly there are two schools for it: the wine version or the milk version. I’m in favor of using the milk for mainly two reasons: it’s what my granny did, so I am used to that, and I find that this version has a more delicate and agreeable taste. PS. 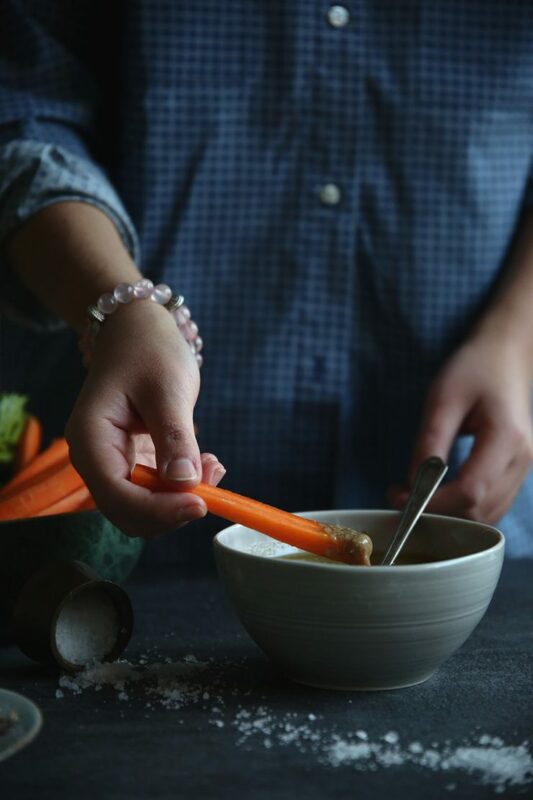 Read this post till the end to find a granny’s tip to make a more digestible and better bagna cauda! Chop grossly the garlic cloves and put them into a saucepan. Cover them with milk. 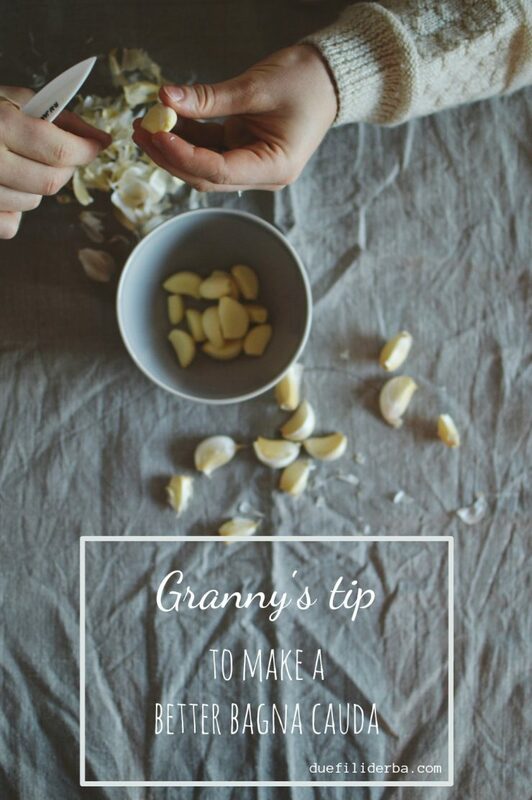 Turn on the stove at very low heat and let the milk boil, stirring every once in a while with a whip for around one hour and a half or until the garlic will soften to a point that it will become like a sauce. Pour the anchovies in the pan and mix till they will melt and they will be well combined with the garlic sauce. Pour the oil and the butter and mix. Let the dip cook for some minutes. Finally, add the cream or milk and stir. Clean and cut the vegetables. 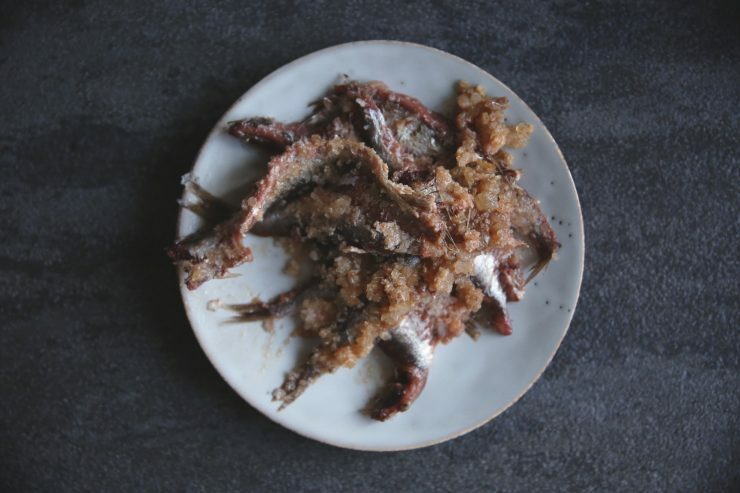 Serve the anchovy dip hot in a bowl (possibly a terracotta one). I have heard of bagna cauda, but never tried it. You’ve made it look beautiful in this post Thais! Thank you Angela! Bagna cauda is not the most photogenic recipe, but I am happy to hear it can look pretty with some help 😉 Have a nice day!